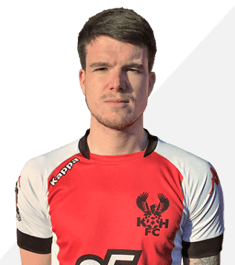 Liam McAlinden signed on loan for the Harriers in mid January 2019 on an initial one month loan deal from Cheltenham Town. Liam started his career with Wolverhampton Wanderers and made his senior debut in April 2013 as a substitute in a 1–2 home defeat to Burnley. His first goal for the club came in September 2013 when he scored against Walsall in the EFL Trophy. A month later he began the first of numerous loan spells with other clubs when he went to Shrewsbury Town for two months. Loans at Fleetwood Town twice and Crawley Town followed before he left Molineux for Exeter City. He stayed at St James Park for two seasons but at the end of his contract with them he signed for Cheltenham Town. He has recently had a short loan spell at Brackley Twon.